Mr. H. Wade Johnson – Block Us Up! Block Us Up! – When I found myself teaching middle school band 8 years ago I didn’t really know how it would turn out. At that point in my career I had taught high school for 8 years and I thought I didn’t have a reference or model for being a middle school band director. Funny thing happened on the first day…. every time I opened my mouth I heard H Wade Johnson’s words, mannerisms, and one liners spew out to an excited group of eager learners. I didn’t realize how much of your teaching strategies I retained since my days of sitting in your classes as a Music Major, but I was thankful I paid attention. Mr Johnson, you are a great educator and we are thankful to have you interview with us and especially in light of your busy touring schedule. Mr. Johnson – Brother Stackhouse you are one of the greatest students that I have had the honor of mentoring. Continue to succeed and make other students lives successful. I appreciate you and it is an honor to be interviewed by you. Block Us Up! – You have had a very interesting journey on your path to Benedict College. You’ve taught at several prominent high school and college band programs across the country, all while maintaining your professional profile as a internationally known Jazz artist who still tours and performs globally. First… How do you do it all and secondly how did your journey through life prepare you for that monumental moment of directing this young program in its very first Honda Battle Of The Bands Performance? Mr. Johnson – Being blessed to reach the masses is truly a God given gift. From a high school football injury, which was the reason I joined the band my senior year in high school, to the position I hold today God has always been in control. When God is in control all things work together for the good. Secondly I am passionate about what I do. It is said that your gift will make room for you. I believe I was destined to do what I do. This is my ministry. He has called me to teach and perform!!!! Block Us Up! 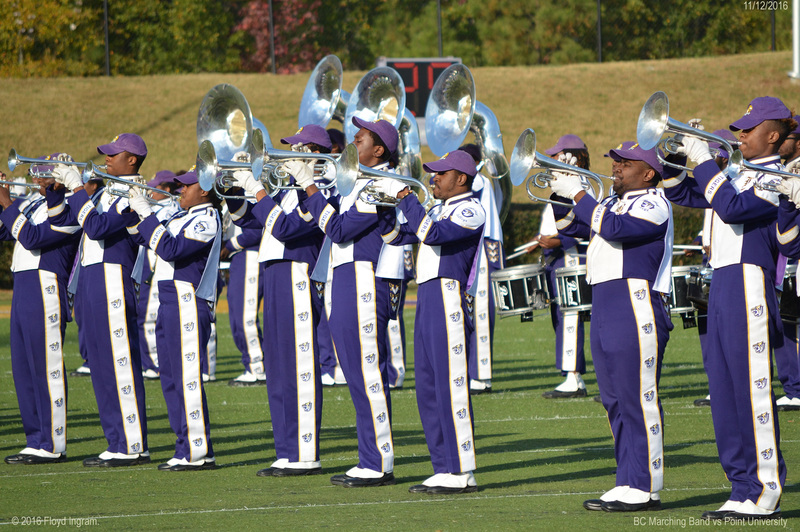 – I am sure the students were excited about their very first Honda Battle Of The Bands performance in Atlanta last month for what was well over 60,000 fans. With all the success and attention the program has received, I am sure that this entire year has been sort of bitter sweet as the Tiger family lost a dear brother, Mr. Herman Jones, suddenly and unexpectedly. Losing a director was surely painful for the students, as was your lost of a dear friend. What was it like preparing the band all year long, as the new director, under those circumstances? Mr. Johnson – Loss of a loved one is always difficult, but losing such a celebrated and cherished member of the Tiger Family was especially challenging… My staff and I continue to give the utmost reverence to the memory of Professor Jones and to his rich legacy established here at Benedict College. We dedicated the entire band season to him for his service to the Benedict College family and his unswerving loyalty to this institution. From the very start, the students understood the purpose behind this season and the importance of lifting the legacy of Mr Jones. They stepped up to the challenge. We honor the late Herman Jones for his successful tenure and leadership at Benedict College. Due to the aforementioned circumstances the band was put under new leadership and with new leadership comes change so there have been some changes because the band is indicative of its directors. My assistant, Ronald Green, and I told the band that if they put their trust in us and bought into our program, we would eventually make it to the Honda Battle Of The Bands. We had a 3 year plan of execution. We were blessed to make it in our first year. God is great and worthy to be praised. The students enjoyed this season at Benedict College and they are looking forward to what the future holds. The Band of Distinction is gaining popularity through out the country. It is truly exciting. Block Us Up! – Yes! And after what was truly a remarkable inaugural season, you made it to the Honda Battle Of the Bands! I am sure the passion and drive that was building throughout the entire season reached its climax in The Dome on that Saturday afternoon! I can definitely identify with the hard work and long hours that it took to prepare such a great performance, but for the readers who have never sat under your baton, could you describe exactly what an H Wade Johnson band rehearsal is like? Mr. Johnson – Lol!… Intense… disciplined… Some might say a little crazy. Lol! Intense focus on certain performance standards to maintain consistency, discipline, and order but definitely educational and unforgettable!!!! We rehearse not to get it right; but to never get it wrong. In the words of Ronald Sarjeant my former band director, “We leave nothing else to be desired!!! !” Nuff said. Block Us Up! – During some point in all my interviews we take a turn and walk over to the band geek table so here we are… What is your warmup process like? Do you use the same warm-up routine for concert band that you do for marching band? I know you guys received a truck load of new Conn-Selmer instruments and that helps with sonority but what other steps do you take to minimize intonation issues that are bound to occur? Mr. Johnson – The warm up process is very important to our band’s success. Band Directors out there you should ALWAYS warm up and tune your band. No matter what the situation. Using scales, chorales, chromatic exercises, and lip slurs are always effective. Doesn’t have to be fancy to be effective. Using your concert band material in the marching band setting is helpful and easier to interchange between ensembles. Playing scales at various dynamic levels, styles, and utilizing various articulation is essential to a good brass warmup. Also nothing beats Chorales played slow and long at various “soft levels”. Extensive tuning throughout your rehearsal, not just the warmup is required. In essence you want your marching band to sound like a moving concert band. Mr. Johnson – Lollollollol. No. It’s just a rumor. Our goal is to recruit, retain and graduate our student musicians. We also will attempt to sustain a group size that would not be a financial burden to the College. I believe that if 5% of the school population is performing in the band program then it’s successful… So the size remains to be seen. Above all else you really want to make sure that your program is not a financial burden on the institution. Block Us Up! – You’ve been known to play two instruments at the same time during your stage act. I’ve been told that in order to use both sides of your brain in that manner (with each side controlling the opposite side of the body) you have to be a lil crazy… LOL! When and how was that technique developed? Are you the first to do it? Mr. Johnson – Lol! I played with Dizzy Gillespie in the 80’s and saw one of his trumpeters do it!!! I was amazed by it! Frank Motley taught me how to do it. It took me 7 years to perfect it. There are three others who can do it but not as long and controlled as I can. It’s right left brain operating simultaneously. Block Us Up! – More band directors are taking a serious look at public relations and branding nowadays… With sites like mine constantly viewing your performances and critiquing every detail of your presentation, its important to “create your own narrative” in some instances. As the new director of this program, what are you currently doing to increase your social media footprint? Mr. Johnson – The development of a new band web-site has recently been completed. Visit this site for all information on the BOD. We also have a facebook page, and a twitter page in the works, so check us out! Block Us Up! – It has been a pleasure to interview you Mr Johnson. I wish you continued success and I thank you for all you’ve done for college bands and for me personally. If there are any additional comments you’d like to add please do so. Mr. Johnson – Thank you my brother. Keep doing what you do. Mr. Johnson has performed professionally with Lou Rawls, The Temptations, Frank Foster (Conductor and Lead Saxophonist of the Count Basie Orchestra), Joe Sample (keyboardist and founder of “The Jazz Crusaders”), Fred Wesley (former leader of the James Brown Band), Marvin Sapp, and Dorinda Clark Cole. Mr. Johnson has received numerous awards including the Thomas A. Dorsey Competition Award, The Conductors Ward, and he was the First Inductee into The South Carolina State University Jazz Hall of Fame.